Can I view the hidden part of page after zooming through moving mouse? It must be very clear that the mouse follows your mind to the part you want to view more clearly. You know, after zoom the flipping page in, due to the limited size of screen, you could just view part of the page. To your surprised, without clicks, you just move the mouse to the hidden part of flipping page, and then it displays inch by inch which follows the mouse moving. When the part you want show all in front of you, stop move mouse. After view it, you just move mouse again to the next part. 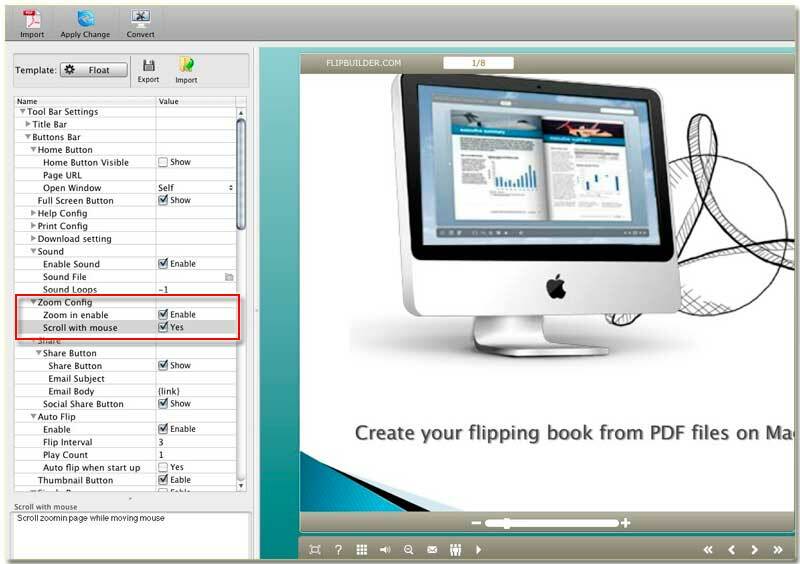 FlipBook Creator for MAC supports this functionality. Step1: Start FlipBook Creator for MAC, you know, this tool only can be ran on MAC (it explains in its name), and then import a PDF to edit. Step2: We should find the option about zooming in the left settings muster as the follow illustration shown. Step3: you can only check the first option (Zoom in enable), the second setting (Scroll with Mouse) is optional and on the premise of the first setting. On the output flash flipping book, you can move the mouse after zooming in some page to test accurately.